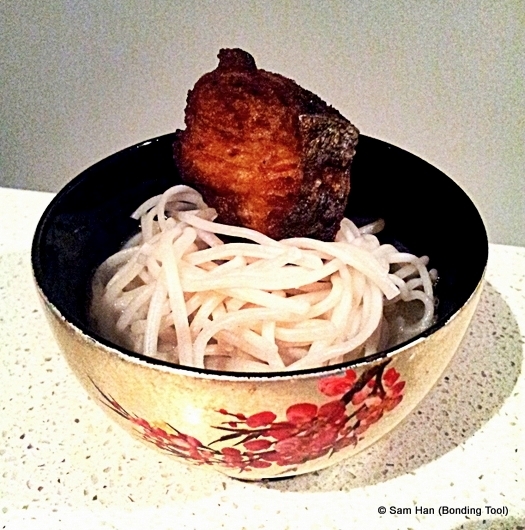 Yummilicious Fried Fish Noodle Soup. 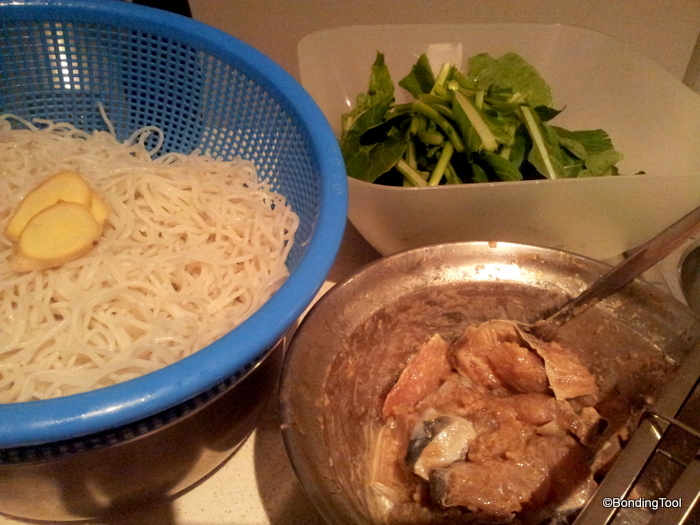 Ingredients for Fried Fish Noodle Soup. Some Hennessy X.O. Brandy for your Fried Fish (Head) Bee Hoon Soup? 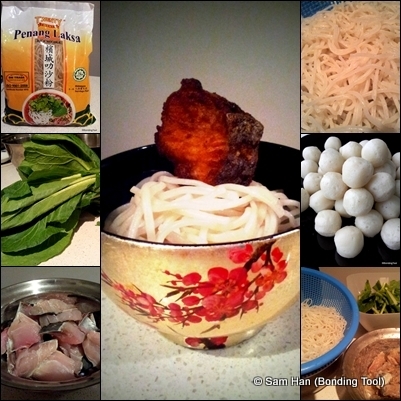 600g Fresh Coarse Bee Hoon (Laksa Noodles – if using the dried packet type, follow the instructions on the packaging). 1 kg Fish or Fish Head, cut into chunky 2-3 inch pieces (Toman, Garoupa, Mackerel, Red Snapper). 1-2 bunches Mustard Greens (Chye Sim, Choy Sum). 500g Pork Fats to make crispy lard, optional. If the pork fat came in a slab, cut them into ½ inch cubes and soak them in hot boiling water for 5 minutes. Drain away the water and pat dry with paper towels. In a dry wok or pot, put the lard cubes in and turn heat to medium. Let the fats turn into oil. Stir the contents occasionally until the cubes become crispy. Strain out the crispy fats and let cool spread out on a tray lined with oil absorbent paper. Keep pork oil for garnishing (see “tastier method” step 4 below) and other uses if desired. 1 tablespoon Old Ginger Juice (grate ginger finely and squeeze to extract). 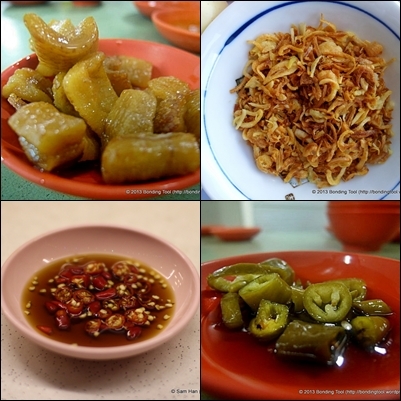 1 tablespoon Hua Tiao Chiew (or cooking sherry). ½ teaspoon White Pepper Powder. Enough Oil to deep-fry fish. Evaporated Milk or Fresh Milk, optional (I use this as I like a creamier bodied soup. Carnation for evaporated Meiji for fresh milk are my choice – up to 150ml). Marinate the fish for at least half an hour if in a hurry or overnight if you wish. If marinating overnight, go easy on the salt as I feel they tend to be saltier. Deep-fry fish pieces in batches till golden and crisp about 5-8 minutes. Drain on oil absorbent paper and leave aside. 500g Ikan Bilis (Dried Anchovies). 1 Sour Plum, break by twisting between fingers, optional (those used for steaming fish – if you like a slight sour and tangy taste to your soup). Rinsed the ikan bilis well and drain dry. Put all 3-4 ingredients into a muslin bag. Bring water to the boil and add in the ikan bilis, ginger and garlic. and boil for 5 minutes. Lower heat to medium (gentle boiling ripples) and simmer for 45-60 minutes. Strain, discard the contents and reserve stock for use later. Add evaporated or fresh milk (can use half and half) until the desired creaminess. You can omit this if lactose intolerant or simply don’t like it. Szechuan or Salted Vegetables, rinsed very well, squeezed dry and julienne thinly. optional. 1. Scald the fresh noodles with boiling hot water. Strain away water. 2. Re-heat the prepared stock. When boiling, add in the tomato, noodles, mustard greens and fried fish pieces. If using fish balls, add in at this stage also. Let the soup come to the boil again and fish balls floats to the top and has turned opaque. 3. Adjust seasoning with more oyster sauce, sugar, salt, pepper and milk (if using) to your taste. 4. Drizzle in a tablespoon or two of the pork lard oil. 5. Turn off heat and ladle noodles with soup into individual serving bowls. 6. Some people put a tablespoon of brandy (Hennessy X.O.) into the individual bowl for extra oomph! 7. Garnish and serve with chilli dipping sauce. 1. In a big pot of boiling water, scald noodles and mustard greens for 3-5 minutes. 2. Put in noodles, vegetables and some fried fish into individual serving bowls and ladle the soup into them. 3. Garnish and serve with chilli dipping sauce.